Facebook is usually pretty good at telling me information. I probably should visit the site less than I do--like when I should be carrying on a conversation with my husband before he falls asleep after a long day at work and not just half listening and half browsing status updates--but it's helped me track down athletes to profile, news, and random happenings of my friends. But lately I've been hooked on the fan pages related to the Olympics. I've friended just about everyone and everything from Julia Mancuso to Whistler Blackcomb. And as a result I've wanted to buy one of Mancuso's sweatshirts especially when she said they were traveling with her to Whistler--too bad the ordering system wasn't working last week when I tried--and I read about her Kiss My Tiara underwear before the Today Show shared its release. I've wanted to magically apparate Harry Potter style to Vancouver to chase the motorcade with Wayne Gretzky and the Olympic torch, and I wanted to be able to submit pictures from the Games in hopes of winning tickets to an event or two (wish I could remember which fan page that was a part of). But my favorite news came just a few minutes ago courtesy of Whistler Blackcomb, informing me of the event updates from alpine ski central. After a couple of days of holding the ski runs due to pea-soup-like weather atop Whistler mountain, the men's downhill race took place earlier this afternoon with the results already announced online. It didn't surprise me that I didn't recognize the gold and silver winners--Didier Defago and Aksel Lund Svindal, respectively--because I haven't followed enough of the World Cup races on Universal Sports this season. 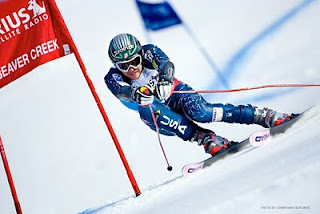 But I was pleasantly surprised over Bode Miller taking home the bronze.